This recipe makes one plate, but you can easily double the recipe to make additional servings. Scrub the potatoes clean and dice them into small cubes (about 1 cm / 1/2 inch). Heat the oil in a 20 cm / 8 inch non-stick skillet on medium-high heat. Add in diced onions and potatoes and sautee until the potatoes are lightly browned, about 5 minutes. Using a spatula, lightly push the potato and onions together, forming a pancake shape island in the middle of the skillet. Crack an egg on top of the potatoes and sprinkle on half of the cheese. Cover the skillet and cook until the egg whites are cooked, but the yolk is still runny, about 2-3 minutes. Remove from heat and carefully slide the potatoes and egg off the skillet onto a plate. Sprinkle on the scallions, rosemary and remaining cheese. Add salt and pepper to taste, and serve with ketchup. 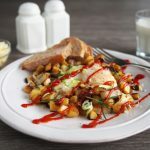 Get this recipe for Skillet Potatoes and Eggs at https://www.theworktop.com/breakfast-brunch-recipes/skillet-potatoes-eggs/.